The artistic programme of the House known as ‘Duchess Anne’s House’ was intended to affirm the status of the first owner, who commissioned the works. The interior courtyard—or lantern—harks back to a kind of architecture found only in Morlaix. This four-sided space situated at the heart of the building was originally lit by a light fitting under a blind roof. In the case of the House known as ‘Duchess Anne’s House’, the courtyard is just over 25 m2 in surface area and is around 16 m high up to the timber structure. 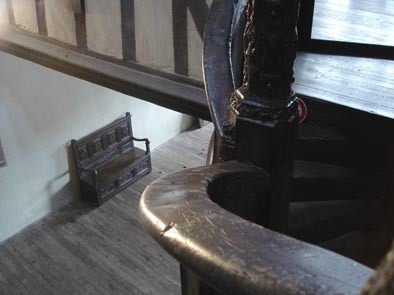 Against the south-east wall, facing the huge fireplace, is the spiral staircase, built entirely from oak. A gallery opens off at each level and leads to the rooms at the back. Oak balustrades ensure the safety of anyone using these galleries. The thrust generated by the staircase is taken by a pillar—the column—carved from a single tree trunk and measuring 10.8 m high. If one disregards the two friezes of vine branches and masks that decorate the mantelpiece, the staircase carries the entire iconographic programme of the interior of the house. Every surface is worked and finely carved in keeping with the tastes of an epoch that had a horror vacui, a horror of the void. The column is ‘inhabited’ by four holy figures set in niches in the Gothic manner on each floor at the level of the openings towards the galleries. St. Roch, hermit (Montpellier, c. 1350 – † Lombardy? c. 1380). Feast day: 16 August. According to legend, St. Roch caught plague (which was endemic in Europe from the time of the Black Plague of 1346-1350 to the plague outbreak in Marseille of 1720) on his way back from a pilgrimage to Rome. To protect the populace, he hid in the forest where, miraculously, the local lord’s dog brought him bread every day. Eventually the saint was cured by an angel. His story is recounted in his pilgrim’s dress, the angel displaying the bubo (a symptom of plague), the dog and a bit of bread. Invoked against plague, St. Roch is the very symbol of the pilgrim after St. James the Great, depicted on the façade. St. Martin, apostle to the Gauls, bishop (Pannonia, now in Hungary, c. 317 – † Candes, Touraine, c. 397). Feast day: 11 November. The legend of St. Martin has it that, in the winter of 337 AD, while he was a young soldier in the Roman army, he gave half his blanket to a beggar at the gates of the city of Amiens. He is often portrayed cutting this garment in half with his sword. In this instance, he is presented in all his splendour as the archbishop of Tours, though the beggar is present, kneeling in prayer at his feet. During the Middle Ages and the Renaissance, St. Martin was extremely popular in the West. He became venerated as a saint, especially in Tours, where his relics are held. Tours developed into one of the most important pilgrimage sites in the Christian world and is the starting point of one of the four major routes to Santiago de Compostela, the others being Le Puy-en-Velay, Vézelay and Saint-Gilles-du-Gard. St. Christopher, martyr († Samos, Lycia, 3rd century?). Feast day: 25 July. The life of St. Christopher is a matter of legend, though tradition has it that he was beheaded for his faith and so became a martyr. He was first venerated in the 5th century and remained important until the 16th century. In Greek he is Christophorus, Christ-bearer. The saint is depicted here in the usual manner as a large man dressed in a tunic in the old style, leaning on a twisted branch as he crosses a river while bearing on his back the Child, who is also dressed in a tunic. St. Christopher is the patron saint of travellers. St. Michael, archangel. Feast day: 29 September. The archangel St. Michael is portrayed at the top of the column. He is the leader of the heavenly hosts and the defender of the Church. He fights against rebellious angels and the dragon of the Apocalypse. A psychopomp, (from the Greek psukhopompos, he who leads the souls of the dead), he weighs souls on the day of the Last Judgement. In the 16th century, the Church placed itself under his protection in its struggle against the Protestant Reformation. St. Michael is portrayed traditionally here as a knight in combat against the dragon of the Apocalypse, which lies at his feet as he readies himself to expel it from Heaven (Revelations 12: 7-9). 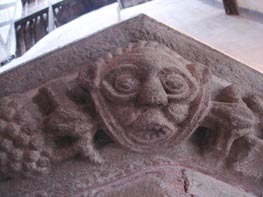 In its agitation, the dragon has coiled its tail around the column. Faith triumphs over Evil. 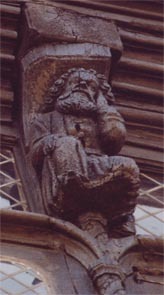 The wild man, an important figure in the medieval imaginary is found decorating both religious and civil buildings and monuments. 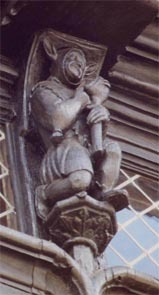 On the façade of the mansion or holding a coat of arms in the interior courtyard, the portrayals of the wild man armed with a club give him the role of guardian of the house. The angel, the messenger from God, whose praise he sings, provides the link between Earth and Heaven. Like the wild man, he often bears a plain blazon as a decorative motif. The role and attributes of the angel and the wild man which decorate the column allow us to perceive a subtle symbolism of union between Heaven and Earth. At the height of its spread during the opening 30 years or so of the 16th century, Protestantism shook the Roman Catholic Church to its spiritual and temporal foundations. In this context, the iconographic programme of the column reaffirms the saints’ role as intercessors and so demonstrates the personal beliefs of the first owner, who was evidently a good Catholic. St. Roch is a relatively recent saint. St. Martin evokes Tours and his pilgrimage: the apostle to the Gauls harks back to the time of Christianity’s establishment as the official religion of the western Roman Empire. St. Christopher, a martyr and the patron saint of travellers, takes us back to the origins of Christianity and the time of persecutions. He is privileged in that he carries the Child on his back. At the top, St. Michael casts Evil out of Heaven and opens the gates of Paradise. The higher we climb towards Heaven, so the saint becomes more important and the more distant chronologically. Consequently, this column helps us to relive Christianity and serves as a kind of map showing the way to Paradise. To expiate one’s sins and to avoid Purgatory or eternal damnation, it is necessary to go on a pilgrimage. As he contemplates the column, the believer sees himself as a pilgrim in the image of St. Roch. Protected by St. Christopher, he reaches Tours, Santiago de Compostela, Rome or Jerusalem and hence the remission of his sins. In its decoration, the column leads the spectator on a spiritual pilgrimage, a symbolic climb up towards Heaven. There is no reference to the Passion or any other passage from the New Testament: the entire iconography evokes a spiritual quest, that of the owner in search of his spiritual health. The acrobat: placed on the upright of the door of the room on the first floor at the rear—above the kitchen—the acrobat seems to invite the visitor to enter what must have been the drawing room. As if alone and free from competition on this side of the courtyard, the acrobat is accorded as much importance as the religious motifs on the column. The two themes co-exist in perfect balance. The first owner took pains to demonstrate his wealth and rank and shares his spiritual concerns and hopes, but does not ignore the simple pleasures of the table and the importance of hospitality. The courtyard as a whole bears witness to the impressive preparatory work, which itself is illustrative of the excellence of the master builder and the sculptors’ workshop employed. 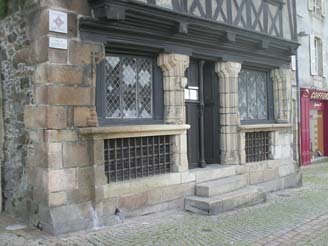 The House known as ‘Duchess Anne’s House’, a half-timbered town house, is situated in the heart of the old town of Morlaix, in the Rue du Mur, formerly the Rue des Nobles. It was listed as a historical monument as early as 1883. 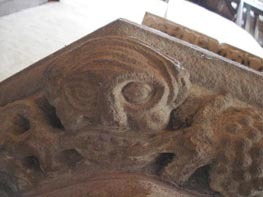 The decorative style and historical context suggest that its construction dates back to 1520-1530. This aristocratic residence is a particularly well-preserved example of what is known as a lantern house, the emblematic architectural principle of the town during the Renaissance: an interior covered courtyard constitutes a well of light in the heart of the building, with a spiral staircase made entirely of oak, and galleries to enable, on the three floors, communication between the front and rear rooms. The intricacy of the interior decoration is suggested on the outside of the building by the ornate quality of the corbelled façade. The interior courtyard is the best example of such intricacy: its ornately sculpted staircase (featuring holy figures, savages, foliage, etc.) rises opposite a fireplace worthy of a castle, which adds to the monumentality of the décor. This opulence, exhibited in the ornamentation of the façade as well as in that of the interior courtyard, enabled the person who commissioned the house to assert his status. The Gothic and Renaissance styles are surprisingly effortlessly combined. 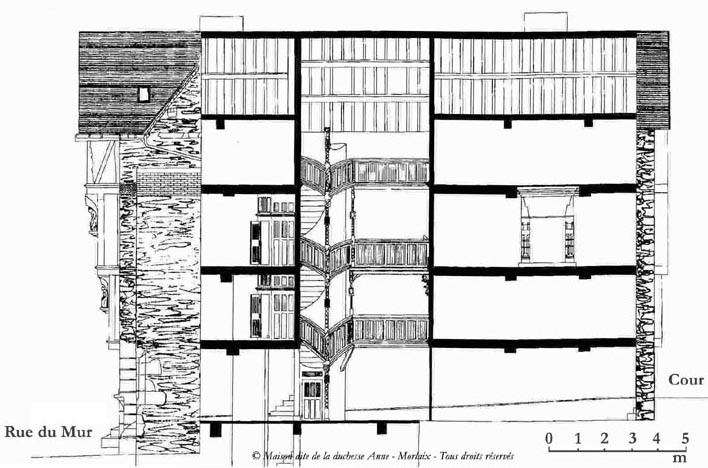 The principle upon which the house was constructed became considerably fashionable: the majority of residences built in Morlaix in the XVI century, be they town houses or shops, adopted this plan. The only slight differences involved lavishness and size. The House known as ‘Duchess Anne’s House’ bears witness to an era of prosperity: that of Morlaix in the XVI century, at a time during which the thriving trade in which its ports were involved made Brittany a leading maritime economic power. Standing in an environment profoundly altered by urban development works done in the second half of the 19th century, the House known as ‘Duchess Anne’s House’ was saved at the very last moment from destruction. Ever since, its half-timbered façade has dominated the old quarter of Les Halles. Its wooden structure resting on a first level of granite is in keeping with a common practice in civil constructions in northern Europe in the Middle Ages and the Renaissance in which timbers were assembled using a system of tenons, mortises and pegs to form the frame, while the spaces between these structural members—closed cavities—were filled with cob, a mixture of clay, straw and animal hair, and then rendered. The pieces of wood were left exposed and much of the visual impact of half-timbered buildings comes from the pleasing contrast between the dark coloured oak and the pale render. The wealth of sculptural ornamentation on the façade heralds the sculpted decorative features in the interior courtyard. Commercial premises and private mansions of this period were built largely along the same lines but are distinguished by the position of the entrance door off the street and by the old names of the streets, which hark back to the socio-economic division of the town between the late Middle Ages and the Renaissance. The main door of the house is positioned centrally and is raised above street level, characteristic of a private mansion. The owner’s coat of arms and its support, on the left post, are now illegible, undoubtedly because they were chipped off at the time of the Revolution, in keeping with the decree of the National Constituent Assembly of 21 June 1790, which declared that all blazons and coats of arms should be suppressed. 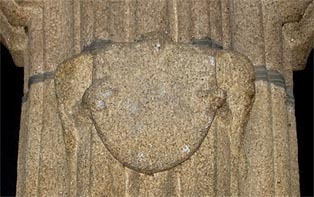 Even so, the damage to the shield and its support suggests that the coat of arms on the House known as ‘Duchess Anne’s House’ was removed by someone acting privately rather than by the authorities, who were far more careful. On either side of the central door is an opening. The one on the left was rebuilt during the restoration work of 1890-1891. At the time when the building was converted into bed-sit accommodation (each room rented out as separated accommodation), with a shop on the ground floor, a new door was added, leading to a passageway to the staircase up to the bed-sits. Under each of these openings is a basement window, now protected by a grille, that allowed supplies to be delivered directly to the cellar. The façade has four statues of saints and six statues on secular themes positioned under corbels to protect them from the weather. The statues of the four saints stand at the corners of the façade under a dais, a mark of their sainthood, and protect both the building and its occupants. The six secular statues are positioned at the level of the fanlights above the windows on the two floors. From left to right on the first floor; St. James the Great and St. Yves; on the second floor, St. Barbara and St. Catherine of Alexandria. St. James the Great († Jerusalem, 44). Feast day: 25 July. James, together with Andrew, Peter and John, was one of the first apostles to follow Christ. Legend has it that following his beheading on the orders of Herod Agrippa, his body was placed by his followers in a boat that was guided by an angel till it reached the coast of Galicia. The increased popularity of the pilgrimage route to his tomb from the 9th century onwards consecrated him as the patron saint of pilgrims, who came from all over Europe to Santiago de Compostela. The statue of the saint has the typical pilgrim’s hat with large brim bearing the scallop shell to which his name is associated. Another element linked to pilgrimage that the saint once held in his right hand but which has since disappeared is the pilgrim’s staff. The open book in his left hand symbolises his work as a preacher announcing the Good News. The presence of this statue announces the artistic features, based on pilgrimage, to be found on the column in the interior courtyard. 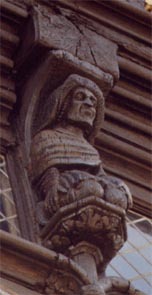 St. Yves, ecclesiastical judge (Kermartin Manor, Minihy-Tréguier, c. 1250 – † Louannec, 1303). Feast day: 19 May. 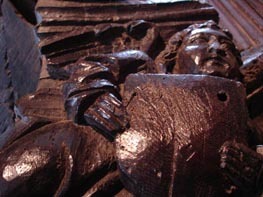 Yves Hélory, the embodiment of the exemplary priest, and is renowned beyond Brittany. Appointed the ecclesiastical judge of the diocese of Tréguier, he was known for his equitable judgments, his devotion to the poor and for his sermons. He died in the odour of sanctity and was widely venerated. He was canonised in 1347. We find him here presiding in his chair under a dais, as would befit an ecclesiastical judge. He wears a long-sleeved tunic under a cloak, with a hood pulled up over a hat that has not yet taken the form of the square hats adopted by legal authorities in the 16th century. Originally, he should have held a book in his left hand and a scroll in his right hand. The presence of the patron saint of lawyers on the façade could be due to the status of the owner. St. Margaret, St. Barbara and St. Catherine of Alexandria (three of the 14 Auxiliary Saints, also known as Holy Helpers) are often associated in iconography. The two saints represented on the second floor are St. Barbara and St. Catherine. St. Barbara, virgin and martyr († Nicomedia, 235?). Feast day: 4 December. Barbara’s father, the satrap Dioscorus, kept her locked up in a tower to protect her from suitors (or from Christianity, according to other versions of the legend). One day, she was converted by a priest passing himself off as a doctor. She fled to escape her father’s wrath and hid in a grotto, but was betrayed by a shepherd and thrown into gaol. After being subjected to various tortures, Barbara was beheaded by her father at the top of a mountain. He was killed at that very instant by a bolt of lightning. St. Barbara is invoked against lightning and sudden death and is the guarantor of a good death. In this statue, she is portrayed holding in her left hand a tower with three windows, the symbol of the Holy Trinity and the place where she was incarcerated and admitted into the Christian faith. Her right hand, since lost, would originally have held the palm leaf of martyrdom. St. Catherine of Alexandria, virgin and martyr († Alexandria, 310?). Feast day: 25 November. A young girl of noble birth renowned for her beauty and erudition, Catherine successfully refuted 50 philosophers sent by the Emperor Maxentius to convince her of the folly of Christianity. She also refused to marry the emperor on the grounds of her mystical marriage to Christ. She was thrown into prison, beaten with iron bars and exposed to four spiked wheels that were intended to cut her to pieces but which shattered thanks to the intervention of an angel, before she was finally beheaded. Her body was transported to Mount Sinai by angels and buried by them there. In her right hand, Saint Catherine holds the sword used to decapitate her. The wheel at her feet evokes those broken apart by the angel. In her left hand, no longer in place, she would once have held the palm leaf of martyrdom. The crown on her head is not that of a martyr but instead recalls her royal birth. St. Catherine of Alexandria is the patron saint of scholars, philosophers, young girls and wheelwrights. One can only imagine the original sense of aesthetic balance created by the four statues before the openwork and hence fragile elements of the staff of St. James, the palms of St. Barbara and St. Catherine, and the book of St. Yves were broken off. An essential part of the medieval and Renaissance imaginary, the wild man, armed with his club, guards the house. He seems to be supporting the overhang of the second floor above him using his club, an effect heightened by the slightly curving form given him by the artist to suggest the weight bearing down on him. He plays with his fool’s bauble while smiling at the visitor, possibly reflecting his own image back at the spectator. This jester reminds us that all men love folly, to return once again to Erasmus, who was alive during the period when the mansion was being built. Placed centrally above the door in a significant position, he would allegorically invite the spectator to introspection. Unlike his neighbours, be they saints or secular figures, which are not difficult to identify, this figure remains a mystery. Sober in bearing and expression, both of which are meaningful, he is clean-shaven and dressed in a long-sleeved robe that reaches down to his feet. Around his waist he wears a wide belt, on his head a simple cap and on his feet square-toed shoes. Most authors after Olivier de Wismes agree in seeing in this figure a ‘mère folle’ (Mother Fool), a hypothesis supported by the nearby fool. Between the 15th and 17th centuries, the Society of the Mother Fool in Dijon was a lively feature of the festive events in this city in Burgundy, in particular on All Fools’ Day. These brotherhoods (the cuckolds in Rouen, Cherbourg and Évreux, the ‘mère sotte’ [also Mother Fool] in Paris), which were common in cities in northern Europe, resembled the authorities, borrowing their strict rules, statutes, hierarchical respect, particular standards and robes, all codes that would have guided the sculptor’s chisel if his intention really had been to sculpt a Mother Fool or similar character. The statue of the house cannot be a version local to Morlaix of the Mother Fool from Dijon. We can only stress the unusual absence of an attribute or symbol that would allow the figure to be clearly identified. The three secular figures on the second floor are of a different category to their peers on the first floor. Certain details suggest that they were installed some time after the mansion was constructed. Apart from the sleeping old man to the right, these sculptures are out of keeping with the three secular statues on the first floor—which are of an outstanding stylistic unity—in that their carving is of notably inferior quality. The sleeping old man must be an element of a Tree of Jesse. As it is taller than the others, this statue does not stand on a console. The figure in the middle with his arms crossed is not sticking his tongue out at passers-by, as has been said on occasions, but by his expression shows the weight he is carrying on his back. The figure to the left, with his large-brimmed hat raised above his head and with his cape, is impossible to identify. The consoles on which these last two sculptures stand are identical, whereas the sculptor or workshop that made the other statues on the façade took care to vary their motifs and dimensions. This factor alone suggests that these sculptures were a subsequent addition. It is worth noting that the property housed an antique dealer’s shop in the early 1880s, a situation that might have prompted such a modification to the façade. Features from houses demolished at that time could have been reused to ‘complete’ the decoration. The statue of Jesse, however, must have come from a religious building. The space now occupied by these three statues would originally have been decorated in a simpler manner with ‘flowering cabbages’, for example, like those that can still be seen on a number of façades on Grand’Rue.